Pitti Palace (Palazzo Pitti) was built by Luca Pitti in the 1400s. A century later, Duchess of Florence Eleonora di Toledo purchased the Renaissance palazzo for her husband, Cosimo I de' Medici, and it remained the official residence of the Grand Duchy of Tuscany until the early 20th century. 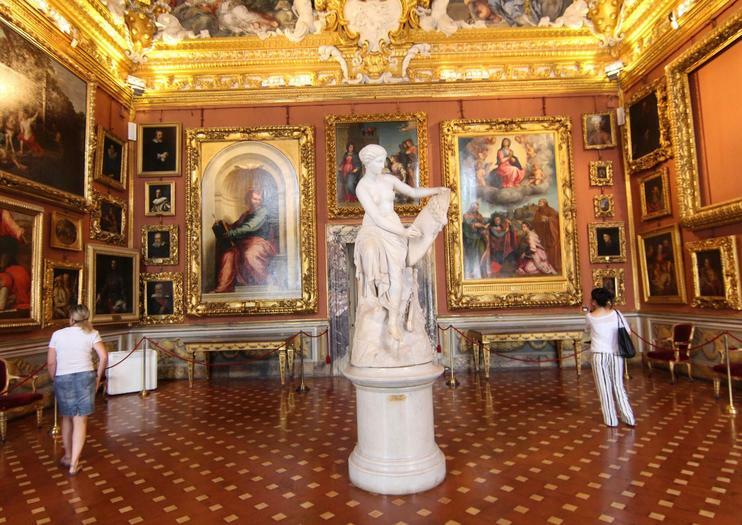 Today, Pitti Palace is Florence's largest museum complex. This massive stone palace was once home to the ruling Medici family, then to the Austrian House of Lorraine, and finally to the House of Savoy—until Victor Emmanuel III donated the palazzo and its contents to the nation of Italy in 1919. A full 140 rooms, housing a number of important museums and galleries, are open to the public. The Palatine Gallery, which holds an impressive collection of Renaissance masterpieces, including works by artists Raphael, Titian and Rubens, is the most famous. Visitors can also tour the sumptuous Royal Apartments, Silver Museum, Porcelain Museum, Carriage Museum, and Costume Gallery. The palazzo even houses a Modern Art Gallery, highlighting Italian painters from the 18th to early-20th centuries. An array of private and group tours, often including skip-the-line access to Pitti Palace and other nearby attractions, are available. Consider joining a walking tour of Florence that visits a number of Renaissance monuments built during the reign of the Medici family. Pitti Palace is one of Florence's most important attractions, home to centuries of art and history. Booking a guided tour including skip-the-line tickets is strongly recommended. Due to the sheer scope of the palace and its collections, by far the best way to visit is with a tour guide who can lead you through the highlights. Large backpacks, bags, and umbrellas are not allowed inside; there is a free cloakroom at the entrance. The palazzo is completely wheelchair accessible. Pitti Palace is on the southern bank of the Arno River in the Oltrarno neighborhood, reached via the Ponte Vecchio bridge near the Uffizi Gallery. Take the No. 11 bus to Piazza San Felice or the C3 or D buses to the Pitti stop. The palazzo can be very crowded between May and October, and at midday. Consider an early-morning or late-afternoon tour to avoid the peak visiting hours. The museums are closed on Mondays and holidays. After visiting Pitti Palace, take a stroll around the adjacent Boboli Gardens, dotted with Renaissance statues, fountains, and grottoes.